Women United is a global, growing force of 70,000+ women in more than 165 communities and dedicated to creating a world of opportunity – for everyone. 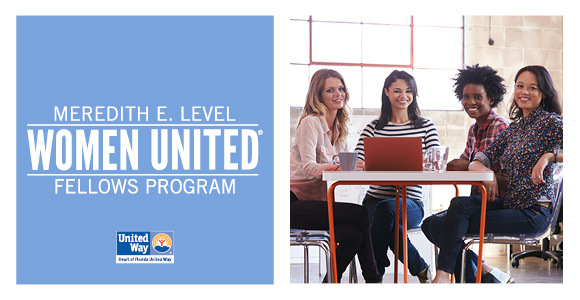 Locally, Women United is comprised of professional women that provide an annual undesignated gift of $1,000 or more to Heart of Florida United Way. Members have the opportunity to participate in networking events, volunteer activities, local and statewide advocacy, and attend the annual Women United Luncheon. 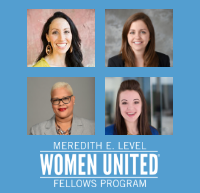 The Meredith E. Level Fellows Program at Heart of Florida United Way is a 5-year program for emerging women business leaders who are passionate about improving our community. Fellows who are selected will gain an in-depth knowledge about the Central Florida community, especially the challenges faced in the areas of education, health, financial stability and basic needs. The program provides opportunities for volunteering, networking and leading with other like-minded women that choose to make Central Florida a better place for all. Selection of a Meredith E. Level Fellow begins with an application followed by an interview process to select the best candidates. Selected Fellows will receive a 2-year scholarship for membership in Women United ($2,000 value) with the expectation of participation in an additional 3-year step-up philanthropy process. For the first two years as a Fellow, you will have the unique opportunity to participate as a member of the Women United Steering Committee and to learn from seasoned members about directing the group in its mission of volunteerism, advocacy and leadership. Fellows are expected to participate in the full 5-year step-up financial philanthropy commitment (detailed below), attend regular meetings of the Women United Steering Committee for the first two years of their Fellowship, participate in Women United networking and volunteer events, and assist with the Women United Luncheon fundraiser each spring. Meredith Level (June 1961-October 2017) was a shareholder at Lowndes, Drosdick, Doster, Kantor & Reed, PA, for over 20 years, acting as chair of their Charitable Contributions Committee since 2002. Meredith organized hundreds of fundraising initiatives on behalf of the firm and in the community, raising thousands of dollars for numerous organizations and foundations—including Heart of Florida United Way. Her service extended to countless nonprofits where she volunteered and served on their boards. She believed that the best investment one could make is to invest in our future leaders. To honor Meredith and her legacy of service and philanthropy, the Women United Fellows program has been created.